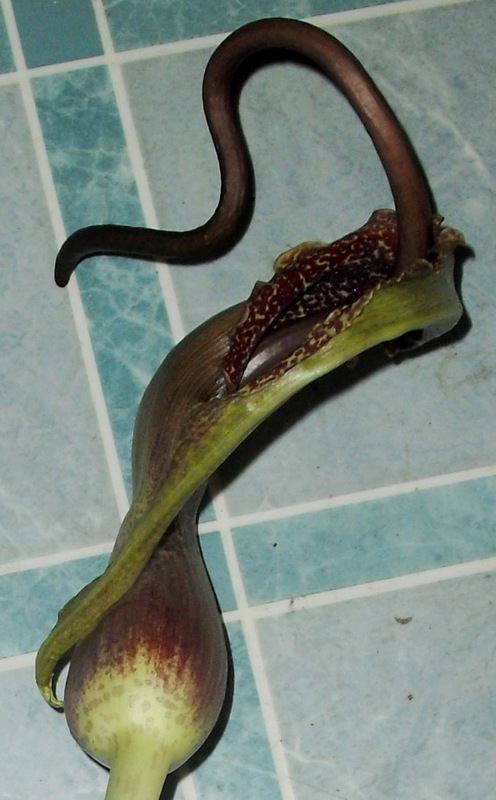 Sauromatum venosum, aka Voodoo Lily. When I put it on the floor to photograph, Peppermint the cat came over to investigate. He took one sniff, and did a giant backward leap, his spine arched and his tail fluffed out in alarm. Two closer looks at the inflorescence. That long dark spadix is normally straight, however being cramped in a small plastic bag for a few weeks caused it to twist. 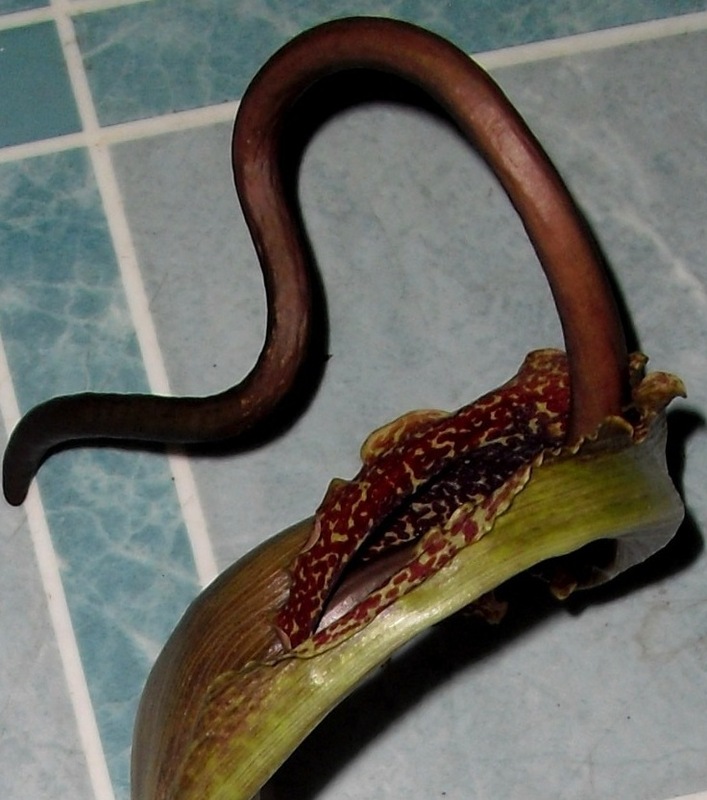 It looks serpentine and sinister, as something called Voodoo Lily should. As intriguing as it looks, something that smells so bad that it discomfits the ever-intrepid Peppermint cannot stay indoors. Even a Crazy Plant Lady has limits. 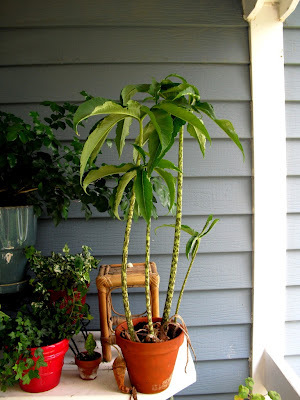 I potted it up and put it outside in the garage, since it was too early in the spring to put it outdoors. Though sources vary on how hardy it is, the far northwestern Chicago suburbs are definitely not in its range. 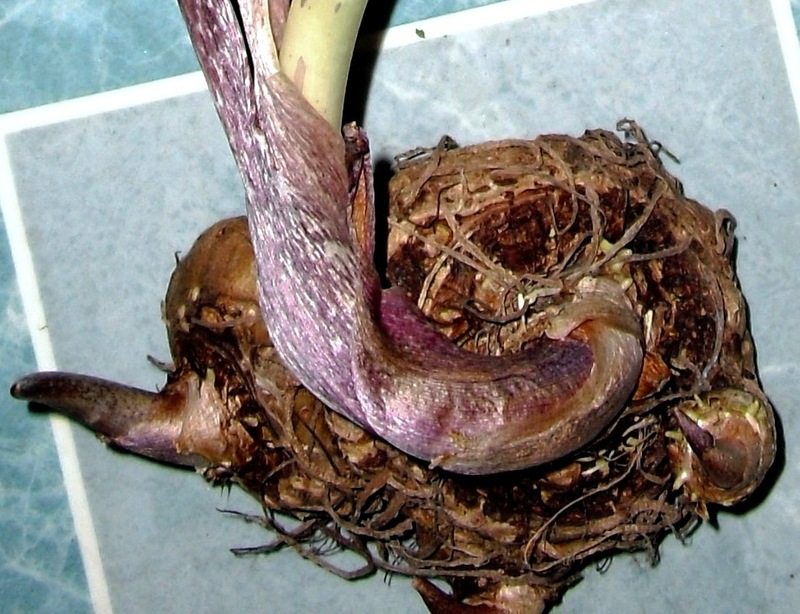 The odor ceased after a day or so, and the flower began to fade. Later that month, I put it out on the porch. 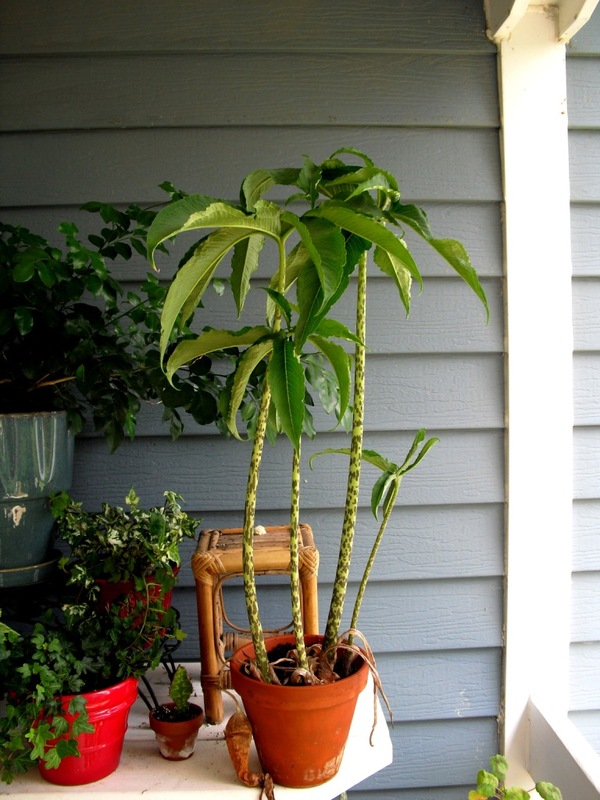 My plans are to enjoy the plant outdoors on my porch for the summer and then decide what to do with it in the fall. Oh, and the other bulbs I bought and forgot about were Liatris spicata for my outdoor garden beds. They were planted out later, and are doing fine. Oh wow...what a story!!! Glad all are doing well. Good save!!! I love how your cat took a leap backwards...too funny!!! Pictured on the floor, it looks very reptilian. Maybe Peppermint's first impression was 'better safe than sorry'. 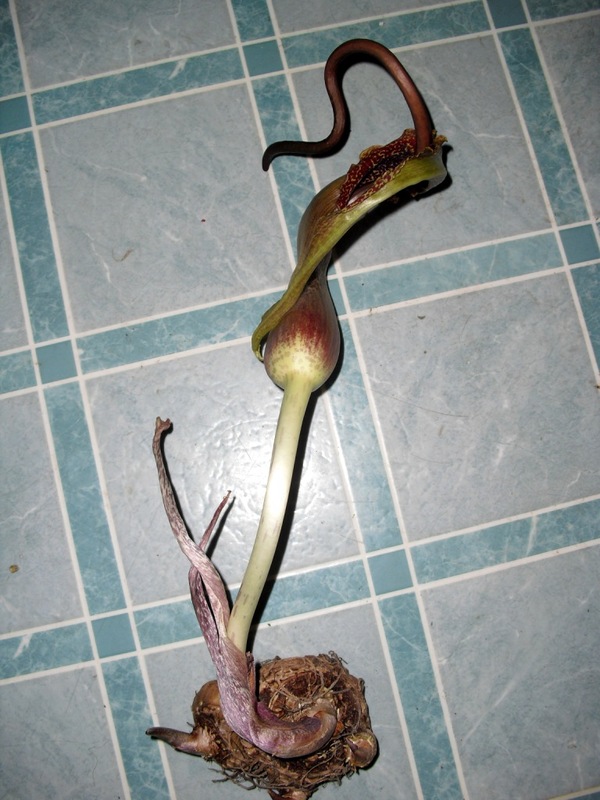 I'd planted one in a very large terrarium - 4' tall (still, where was my head...) Then I moved. The terrarium was too big to move the first rush, and when I came back a couple of days later, it had bloomed. The flower stem was hitting the top, and flies had managed to find their way in. With an idea of what to expect, I opened it. I can feel for Peppermint. Otherwise, beautiful flowers and foliage. What a neat plant! This plant was mentioned in a book I recently read and I wondered what one looked like. 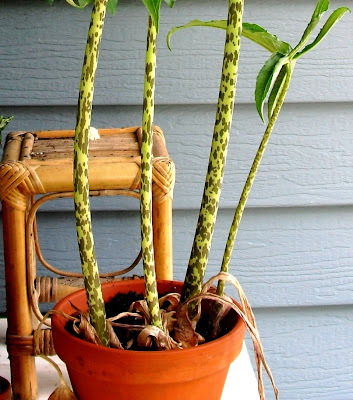 The speckeled stalks are really something! I lol'd at Peppermint's reaction. What a cool looking plant. Great story too. Amazing how a flower would just happen like that, I mean before a plant and all. Really interesting! And it turned out to be a beautiful plant. I love how it looks now.